My sister, Ashley, is flying into Eugene tonight and I could not be more excited. As far as sisters go, she’s basically the best there ever was. We grew up sharing a room, sleeping in each others’ beds for fear of wolves (me) and robbers (her) and raiding each others’ wardrobes (which did not always end well – I am told I can be careless), so this whole living thousands of miles apart thing has been tough. We require lots of quality sister time. Luckily, Ash is always willing to hop on a plane and take a little vacation. So for the next five days we will be wine tasting, hiking, shopping, eating and generally exploring Oregon together. It’s going to be awesome. 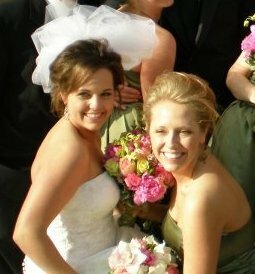 This is us on her wedding day. Isn’t she beautiful?